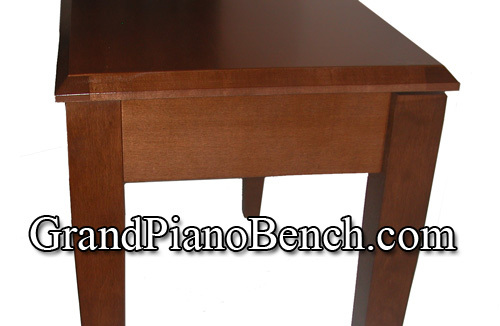 The Jansen Grand Piano Bench is the highest quality wood top Grand Piano Bench manufactured in the United States. 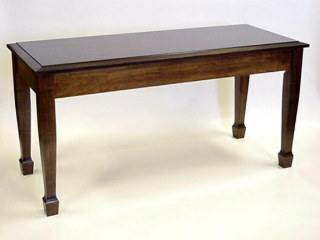 Constructed of solid American hardwood, the bench measures 14"(W) x 33"(L), and is 19" high. The wood top features a beveled edge to complement the smooth seating surface. Supported with heavy duty hardware, the grand piano bench features a routed in music compartment--compared to most of the foreign imported benches, which only staple in their music compartments. By doing this, the wood bottom not only offers a sturdy surface for the heaviest music books, it also acts as structural reinforcement for the entire bench. Jansen piano benches are simply the best benches made today, which is why they are contracted for benches by Steinway, Baldwin and Yamaha pianos. 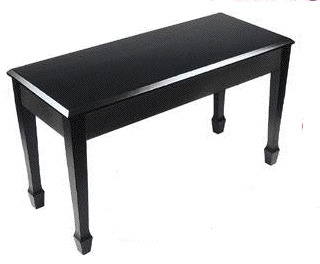 If you are looking for a top-of-the-line piano bench which pays superior attention to quality and craftsmanship, and is built to last for decades, then you want this Jansen piano bench.